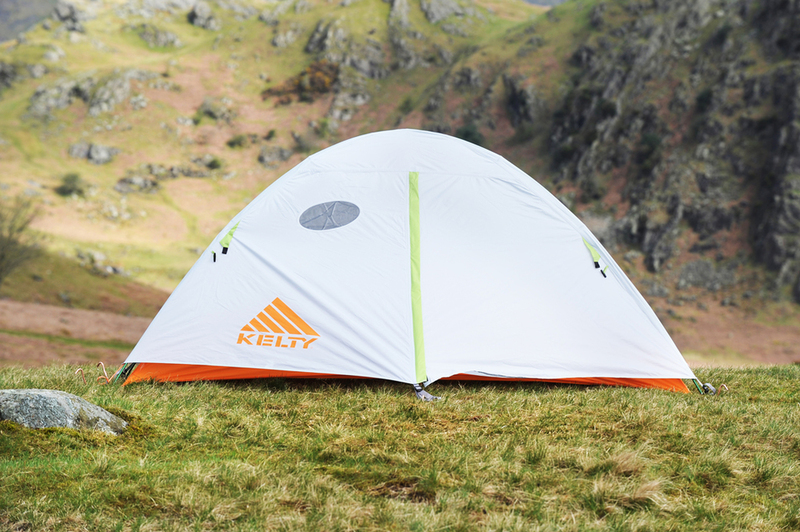 A new brand of tents to the UK, Kelty has been producing great kit from its base in California since 1952. The Gunnison 1.2 is Kelty’s smallest tent. It is a two-pole inner-pitched-first dome and it goes up easily thanks to the poles being shock-corded and linked with a Swivel Hub at the middle. The fly goes over the top and clips to the mouldings at the corners where the poles are fitted, then the fly is tensioned with ladder-lock adjusters. The fly creates a spacious porch on one side and this has a single zip entry, but sadly not a double zip puller, so you cannot vent the top of the door. The door rolls away neatly to the side though and the porch space is ideal for one person with space for a pack and a cooking area. The inner door also rolls away neatly. The inner is long, narrow and tall with enough room to easily sit up, but it’s a little too narrow to take off wet gear and spread your arms widely. The inner has a lot of mesh and the fly does not extend all the way to the ground, so this is a slightly draughty tent in windy weather. If camping in the rain that inner-pitched-first design may be a drawback. But the Kelty Gunnison 1.2 does offer good space, the inner is reasonably taut and the whole tent is more stable than some one-person options. The Kelty Gunnison 1.2 is an easy-to-pitch tent with good space and stability, although some may prefer an outer-pitched-first design for wet-weather camping.